Because the shoulders of the Rachel wrap dress I made recently didn’t fit to well, I put the shoulders and sleeves of the Plantain shirt onto the dress pattern. This was the first time mashing two patterns together like this, I just matched them at the waist, traced the side seam, shoulders and neckline of the Plantain and hoped for the best. As you can see above, the difference was substantial. Vervolgens trok ik een wat minder geliefd stofje uit mijn stoffenkast en ging aan de slag. Then I pulled out a piece of fabric I didn’t especially like anymore and went for it. Perfect gelukt al zeg ik het zelf. De schoudernaad zit waar ie moet zitten en ook de hoogte van de taille is precies goed. De overslag zit ook een stuk steviger nu er niet meer teveel lengte in het bovenlijfje zit. Perfect, if I may say so myself. The shoulder seam is where it needs to be and the waist hits at exactly the right place. The wrap also feels much more secure now the excess lenght is taken out of the bodice. Precies goed / just right. Hij is ook net een stukje korter dan de vorige, die ik bij nader inzien toch wat aan de lange kant vond. Geen ingewikkelde aanpassing, gewoon een kwestie van geen zoomtoeslag aanknippen. It’s also a little shorter than the previous one, which in hindsight I decided is just a little too long. No complicated alterations here, I just didn’t cut any hem allowance. Het enige dat ik nog ga aanpassen aan het patroon is de onderkant van de voorpanden, omdat die aan de kant waar ze overlappen nu iets te lang zijn. The only thing left to change on the pattern is the length of the wrap at the hem, it needs to be shortened a little. Verder ben ik helemaal tevreden over hoe het patroon nu is. Op naar nog tig meer versies 🙂 Voor nu in de planning: een effen donkerrode en een effen zwarte. Serieuze vraag: hoeveel versies van hetzelfde patroon is te veel? Besides the wrap lenght I’m perfectly happy with the fit of this pattern. On to many more versions! So far I’ve already planned a solid dark red and solid black one. Serious question: how many versions of the same pattern is too many? That dress is awesome! The fit looks spot on and I love the print of your fabric! Thank Hanne! I didn’t really like it as a fabric but I do like it as a dress. Somehow I have an irrational fear of printed knits looking like ‘old lady’ prints when made up..
Knap gedaan! En voor een stofje die je niet zo leuk vond komt de jurk wel goed tot zijn recht. Ik vind het zo prachtig. This fits SO WELL! I love everything about it. I don’t think you can have too many versions of a pattern – I’ve never had anyone comment on pattern repetition, even when I’ve worn the same pattern straight for a week during MMM! Stunning result! You can never have too many wrap dresses. Certainly not once you’ve nailed the perfect fit! Super mooi Inge! Wikkeljurken zijn ook mijn favoriet en daar kun je nooit teveel van hebben! 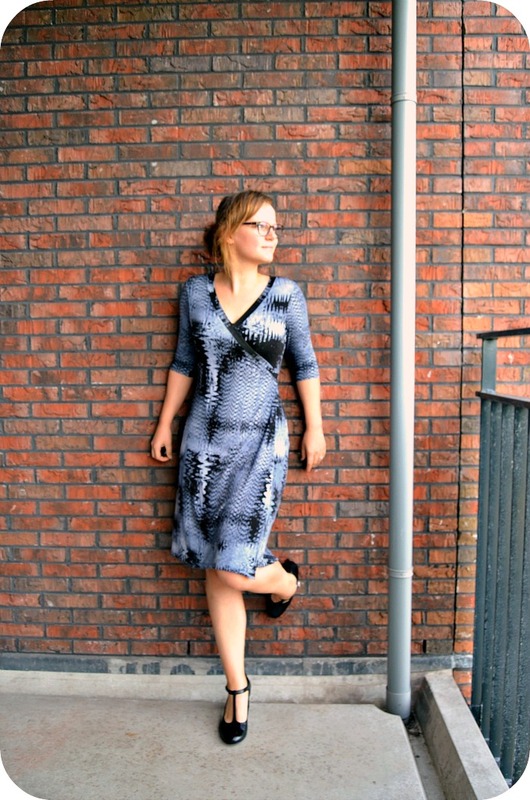 I love how you made a perfect wrap dress by combining two patterns! The fit is great! Make as much as you want! Inge, That is an amazing fit!!! You did great with this pattern mashup. Now yiu make me want to try the plantain top! The sleeves and shoulders look sleek.